A neighbor named Wendy had a cow who lost a calf at birth, and Wendy's been forced to milk the new mama in the absence of the baby. 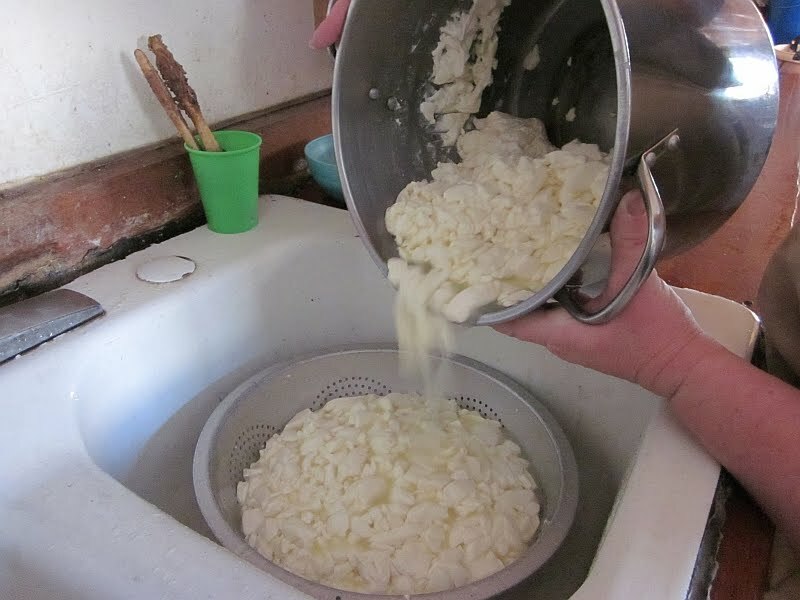 Wendy called and asked if I could make her some mozzarella cheese out of the milk. 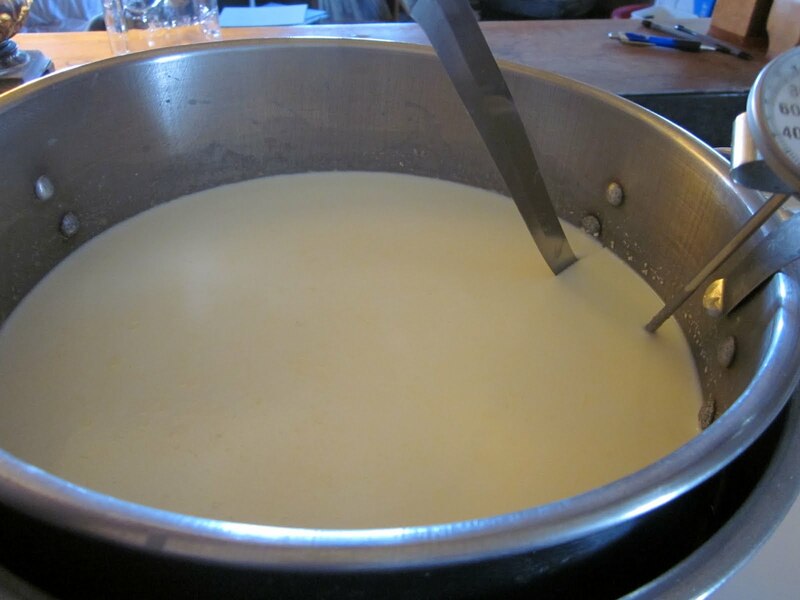 Cheesemaking isn't arduous -- it's mostly a matter of keeping an eagle-eye on the temperature -- but it's a lengthy and drawn-out process. 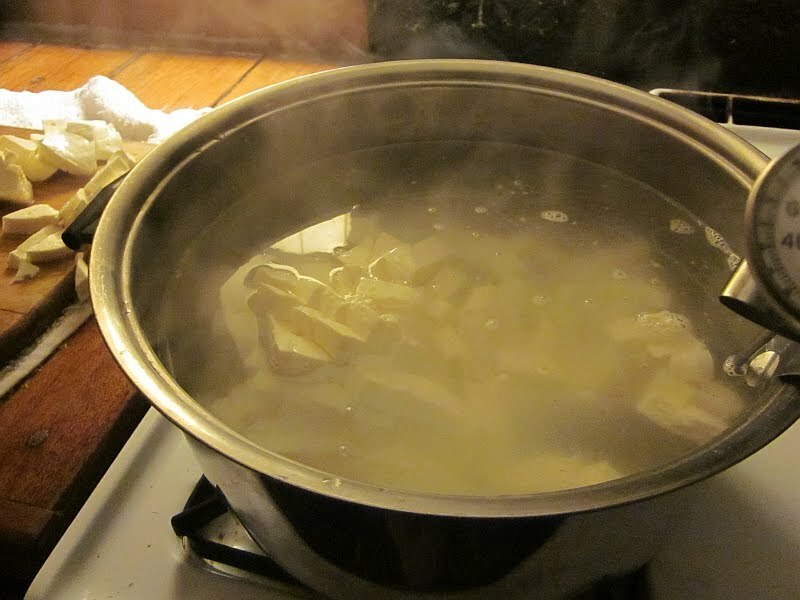 Don't try making cheese unless you plan to be home the whole day. I followed the directions found in this book, Home Cheese Making by Ricki Carroll. 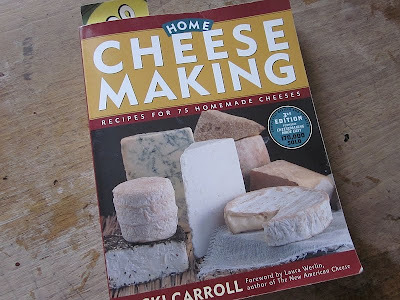 If you're serious about making cheese, this is a wonderful reference book. 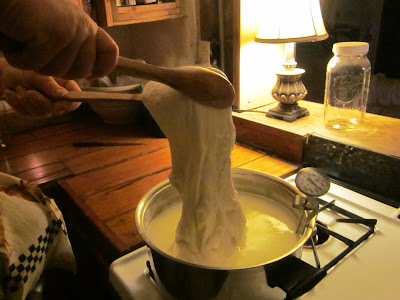 I won't repeat the recipe since it's too much typing, but I do have another blog post on mozzarella cheese here. To two gallons of milk, I added some citric acid to make sure the acidity was high enough. Mozzarella cheese has to be somewhat acidic in order to have that "stretch." 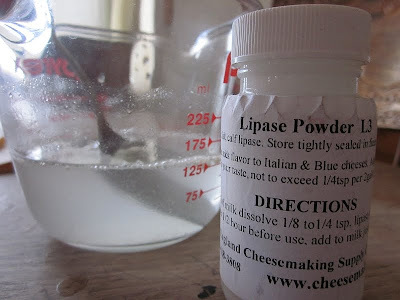 Adding lipase powder. 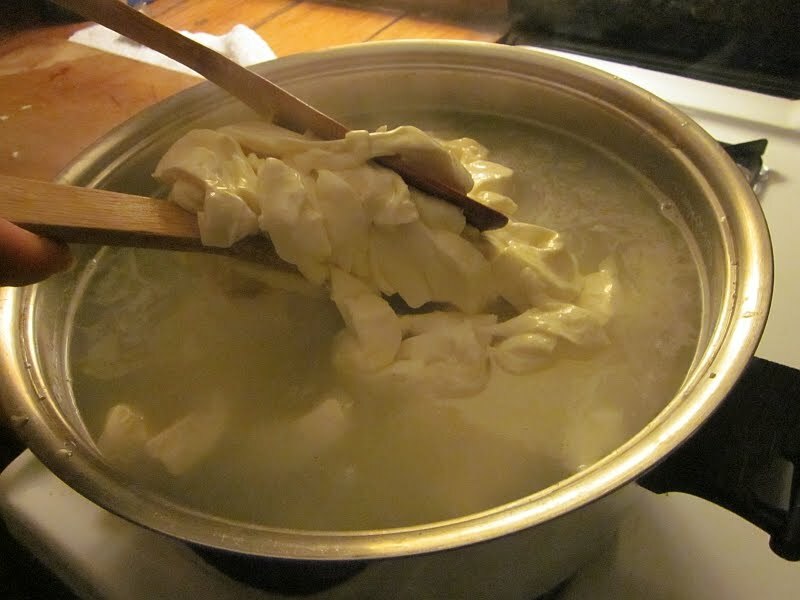 This helps give mozzarella its characteristic taste. ...so now it's time to add rennet. This thickens and "gels" the milk into curds. Takes about 75 minutes for this process to occur. Cutting the curds. Cut in about 1/2" strips one way, then the other way (criss-cross), then diagonally one way, then the other way. 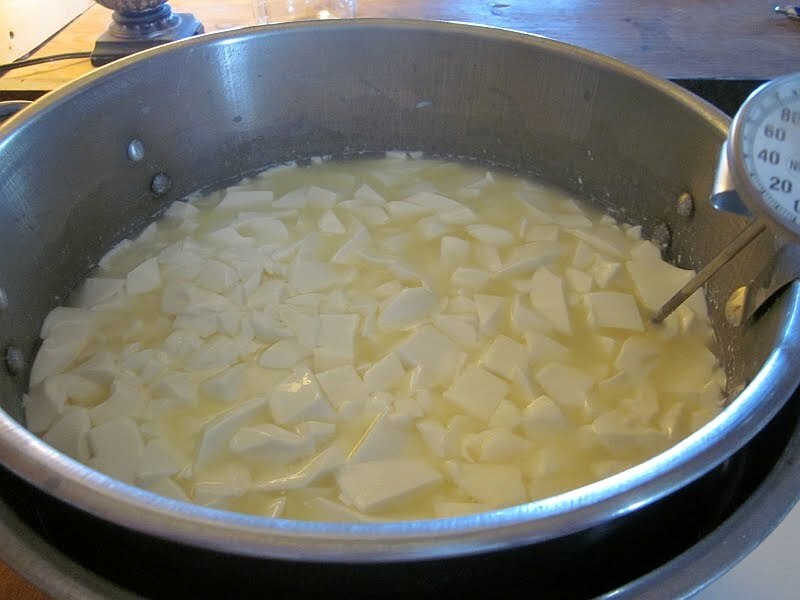 The curds end up looking like this. Stir, then let them rest for 20 minutes. Pouring off the whey. Whey can be used to make ricotta cheese, but I wasn't making that today. As with canning, kitchen timers are your best friend while making cheese. 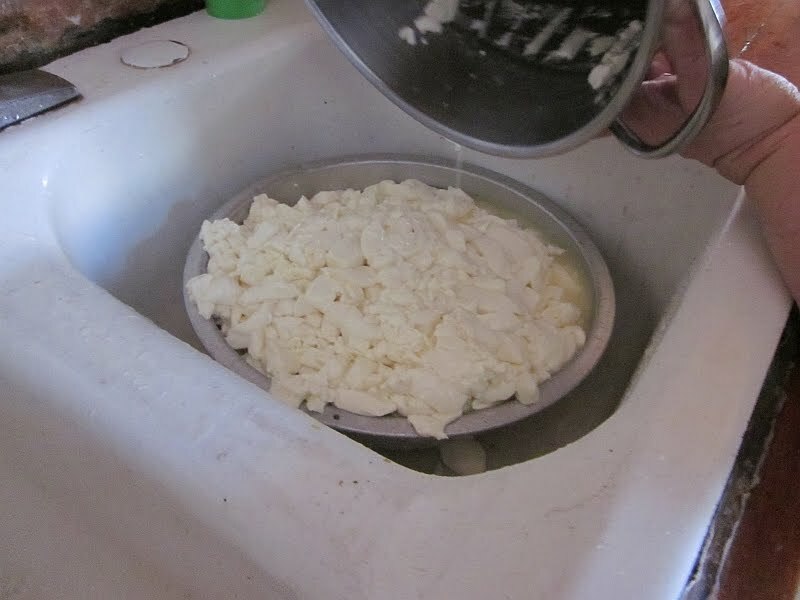 At the end of this process, it's time to turn the curds into cheese. Start with broad wooden spoons. Do NOT use slotted spoons of any sort (as I found out the hard way) because the gooey cheese oozes between the slots and makes a mess. Start a pot of water heating toward 170F. ...and start slicing 'n dicing. It's a juicy process, so be sure to keep a towel beneath the cutting board. 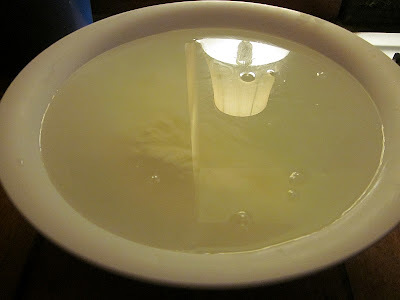 During the second batch of cheese, I balanced the cutting board across the sink and let the excess whey drain directly, which worked much better. When the water in the pot reaches 170F, add the curd cubes. Adding the curd will cool the water, so add more heat as necessary to keep the temperature at 170. Don't go any higher. Then take the wooden spoons and start working the curds, pressing them together. The water will get very cloudy with whey. Keep working the curds, and keep the temp at 170. ...and stretchy. It's now officially cheese. 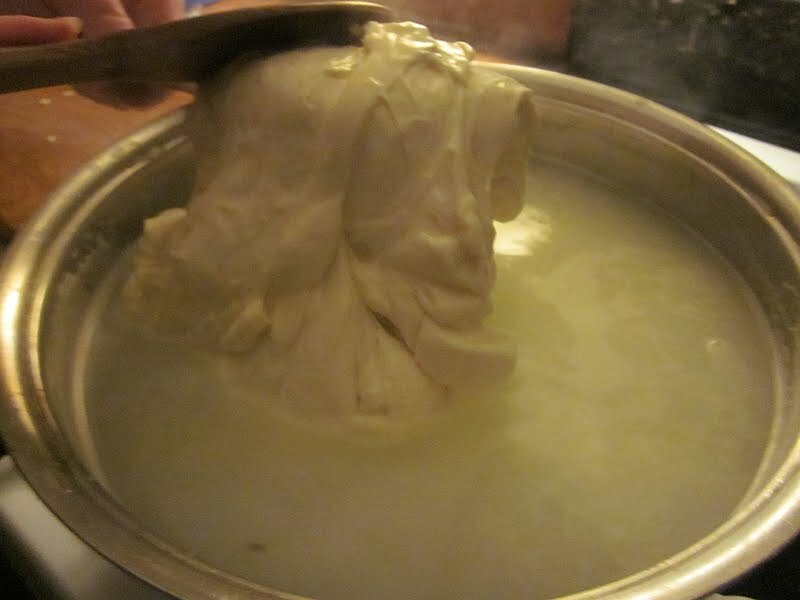 Next take the hot and stretchy cheese and plop it in a bowl of cold water to cool. 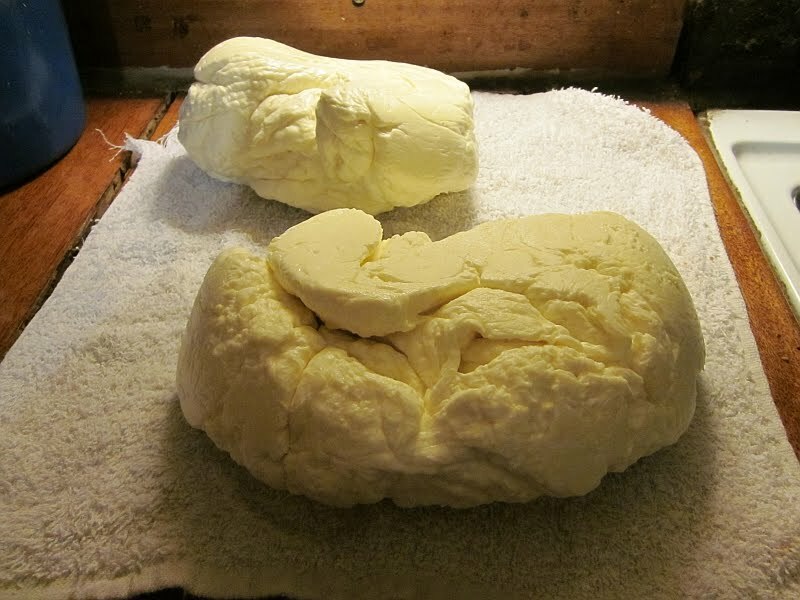 Here's the two batches of cheese I made from Wendy's milk. Looks like nothing more than a couple of brains sitting on my counter, doesn't it? I still need to reach Wendy to find out whether or not she wants me to brine the cheese. Personally I like fresh mozzarella better when it's lightly brined, but of course it's her call. Awesome - I'll be showing this to my husband. Wow! I've made cheese a few times. 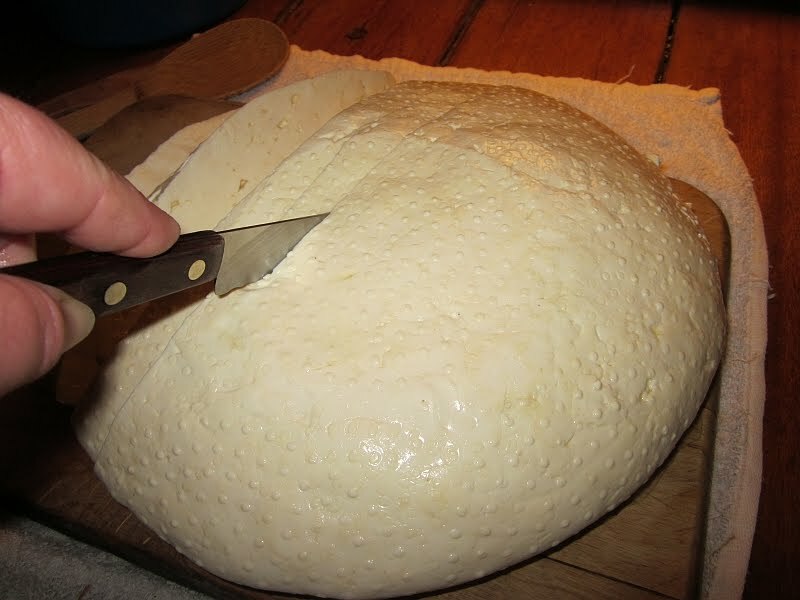 I press my cheese after removing the whey. Maybe it has to do with the kind of cheese. Mozzarella is nice because you can eat it immediately. 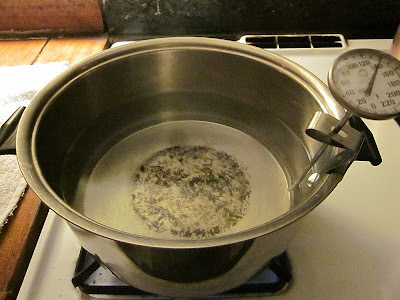 when you sit the colander on top of the hot water was that boiling water? 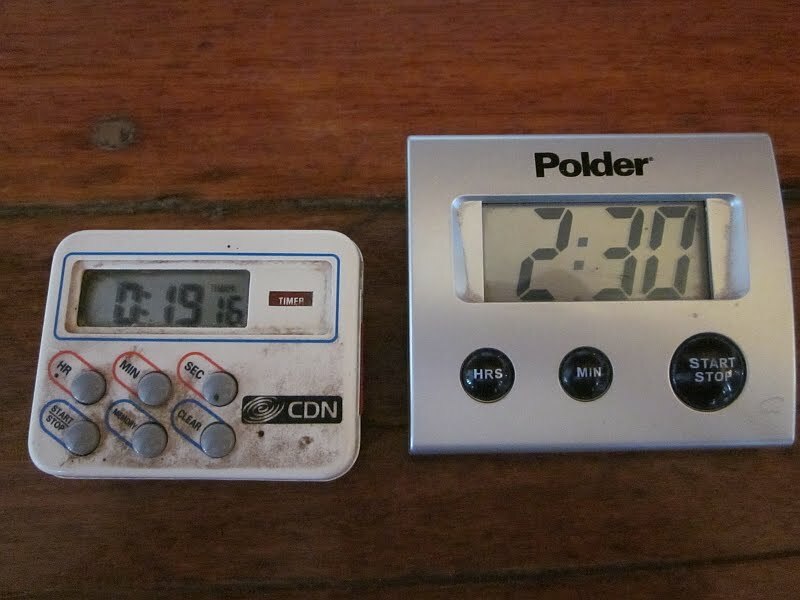 was there a steady heat on? Not boiling, but the water was still hot. If the temperature of the curds in the colander start to drop, I'll heat up the water in the lower pot a bit more, but boiling usually makes things too hot. 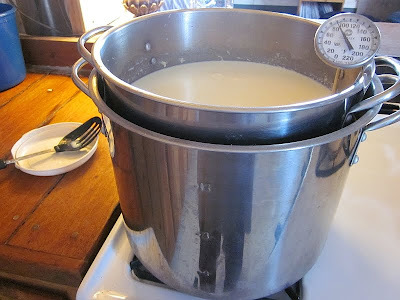 Mostly the stage of the colander over the pot is simply to allow the curds to drain a bit, without letting them get too cool. Canned grapefruit tonight after having seen one of your blogs on canning citrus. Tis that time of the season! Oh gosh, you sound like me when I first tried making mozzarella a few years ago. I started with mozzarella because somehow I thought it was an easier cheese than, say, cheddar. Turned out I was wrong; it's one of the harder cheeses. So don't beat yourself up because you've had failures! I must have had thirty failed batches before I finally got it right, and what really helped was using Ricki Carroll's book. Her recipe has the consistency I needed. 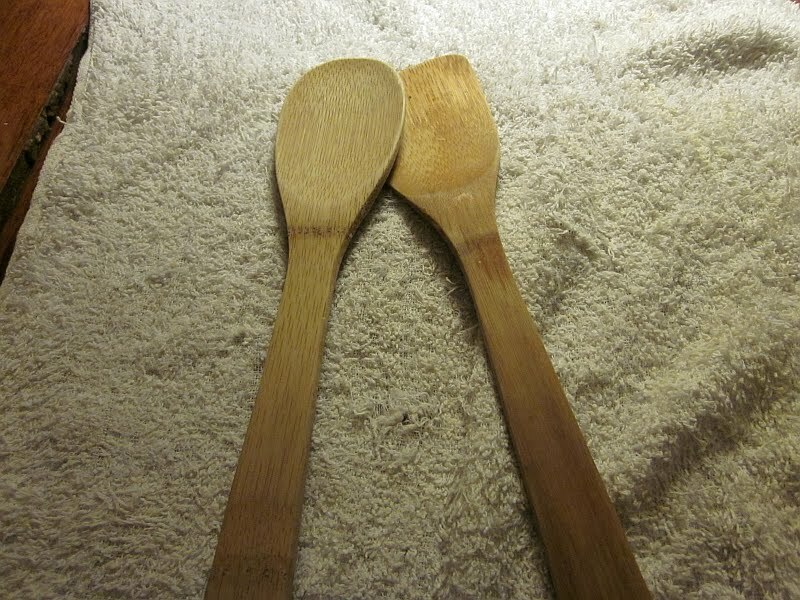 While my pots are stainless steel, I don't believe the pots would make a difference, though I could be wrong. So please don't give up! 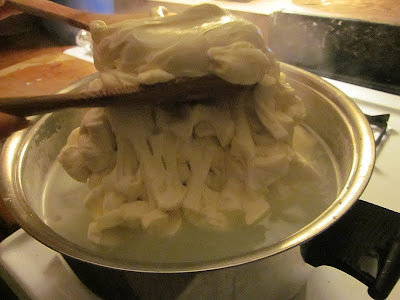 The key is your **determination** to master cheese-making -- because of that determination, you'll succeed! Keep us posted. 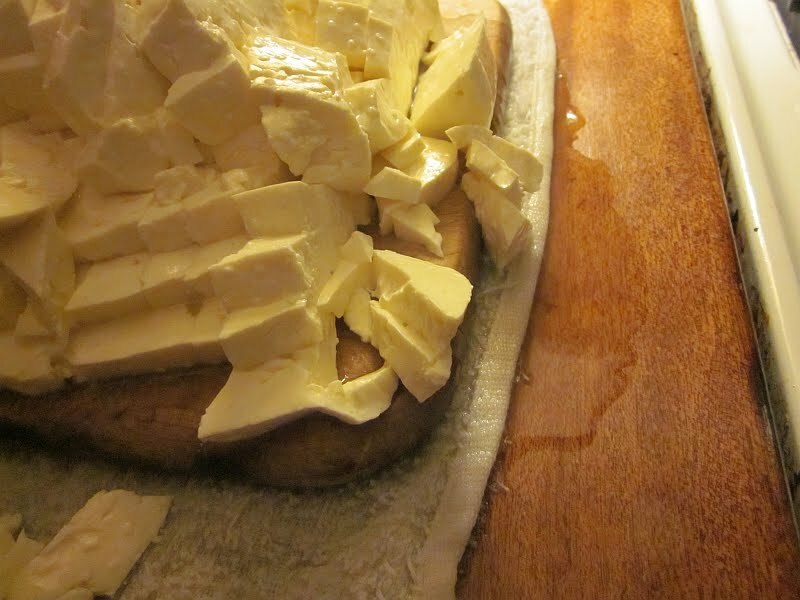 It also shows a few photos of the homemade lever-arm cheese press my husband made. Thank you for posting this. 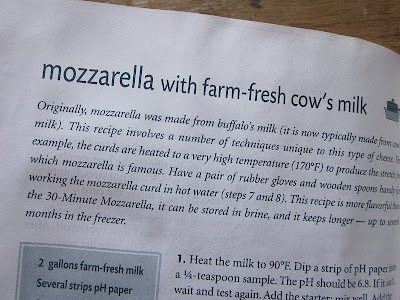 We have our own milk cow and I make all cheeses w/ success, except for mozzarella. I have the book you mentioned. I didn't use the citric acid because I thought it was optional when using raw milk, so I think that is where I have been failing! I will try again this weekend. 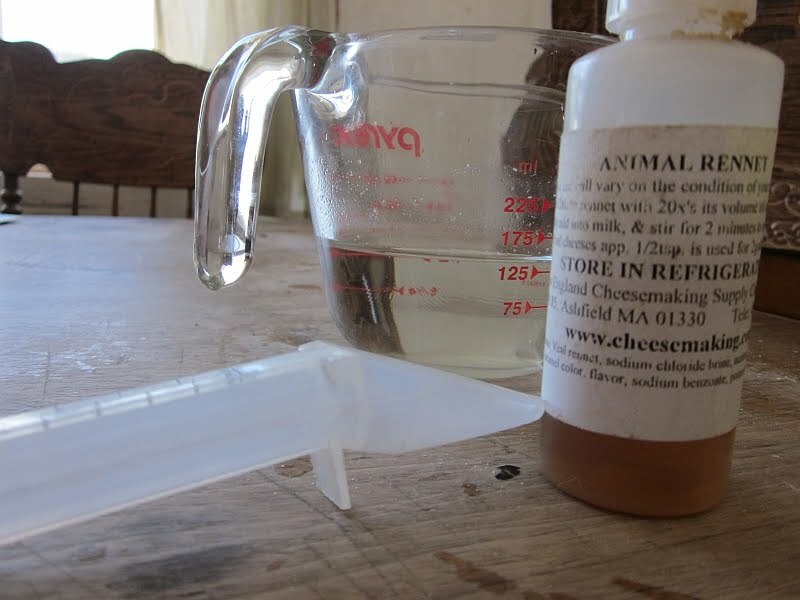 The book talks all about checking the pH here and checking the pH there, to make sure the cheese is sufficiently acidic. To my way of thinking, it's a whole lot easier to just add some citric acid at the beginning and not have to worry about the pH after that. 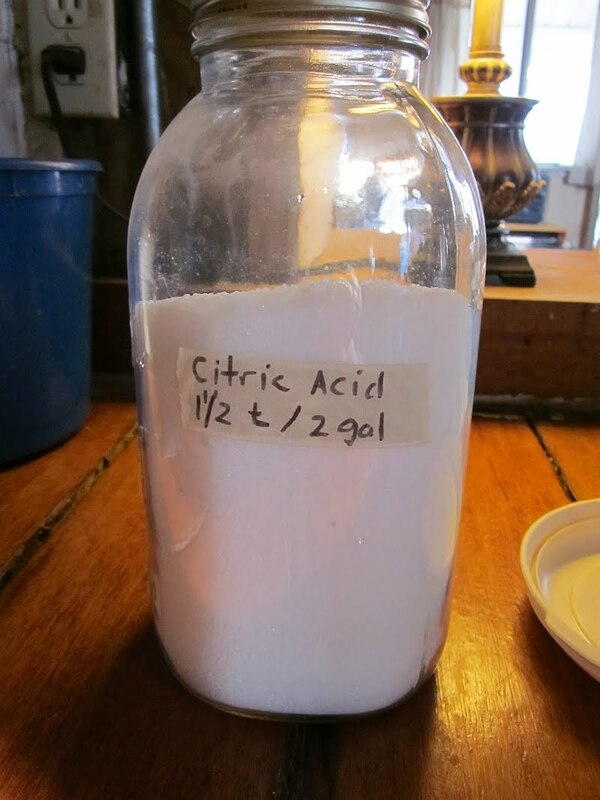 BTW, check with a local health food store for citric acid, they usually have it for a fairly cheap price. Yummy!!! 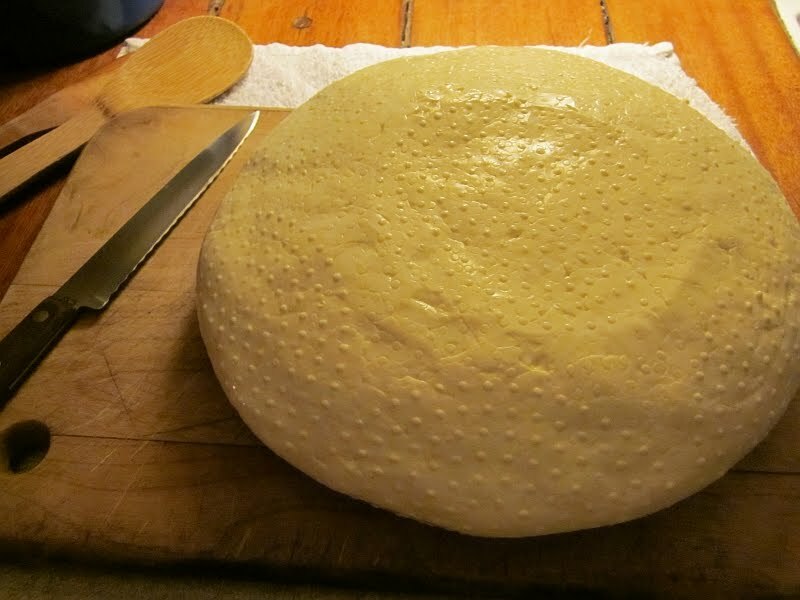 You're the second blog I've read today that posted on making cheese. Have you heard of Range to Range blog? I just found her. You make it look to easy. 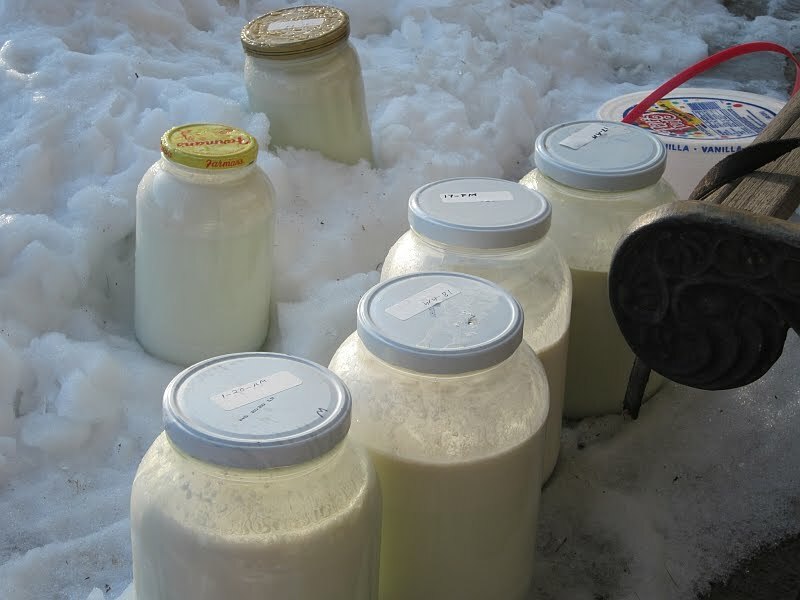 Is the process any different using goats milk? I honestly couldn't say since I've never used goat's milk. Heck, all you can do is try! If it works, let me know. 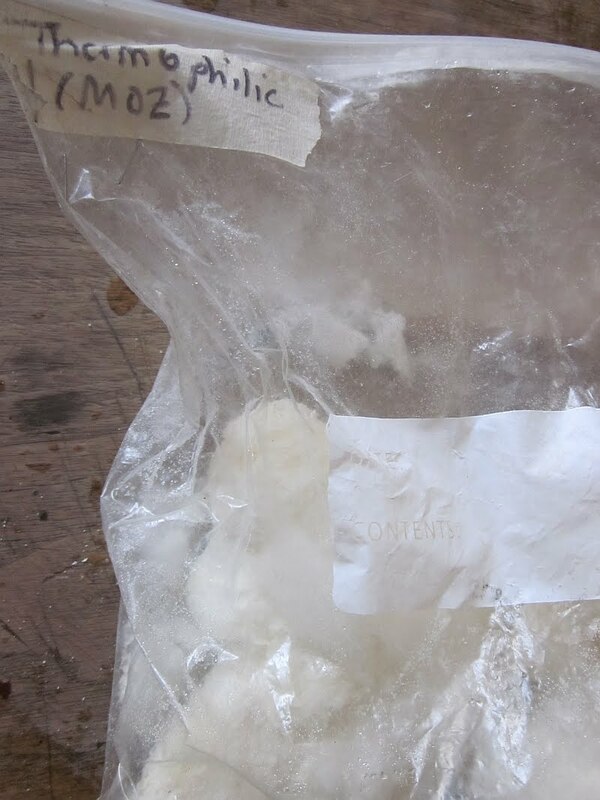 Where do you order your chemicals for cheese making? Except the citric acid. I got that from a local health food store.